The 2009 Formula One season has gotten off to a surprising start with Jenson Button and the new Brawn team winning three of the first four races. An amazing turn around for Brawn, which is the ne’er-do-well Honda team with a new name and Mercedes engines. 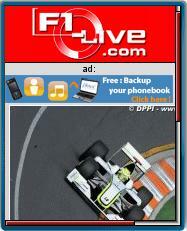 Also new this season is a major redesign of F1-Live.com‘s mobile web site at m.f1-live.com. F1-Live is part of the Montpelier, France based Racing-Live.com group, which was acquired last year by ESPN. The redesign is by Scimob which is also in Montpelier. The Racing-Live family of sites, which also includes Rally-Live, Racing-Live, Raid-Live and Moto-Live.com, is the biggest dedicated online motorsport destination with over three million monthly unique visitors. The new mobile site has the full F1-Live news feed, plus photos, videos, race results, calendar, driver and constructors championship standings and live commentaries on race days. The site uses browser detection and adaptation to provide an optimized experience to the iPhone, Android and other advanced phones as well as to basic feature phones. It’s available in 3 languages, English, French and Spanish. F1-Live has long been my favorite site for F1 news and live coverage, although I liked it better before a lot of the content was put out behind a pay wall a couple of years ago. It’s still the best source of F1 news with frequent daily updates. Fortunately the mobile edition is completely free, including the videos and live reports. If you follow Moto-GP or road rallying be sure to check out F1-Live Mobile’s sister sites, m.rally-live.com and m.moto-live.com which use the same basic design as m-f1-live.com. This entry was posted in Motorsports and tagged espn, F1, mobile site review, Scimob by Dennis Bournique. Bookmark the permalink.